In early December 2017, the Henry Jackson Society brought together leading experts for our very first Radical Islam conference, in order to discuss the prominence and rise of Islamist extremism. The conference triggered the commissioning of a body of work built to collate expert insight on how to tackle radical Islamist extremism. 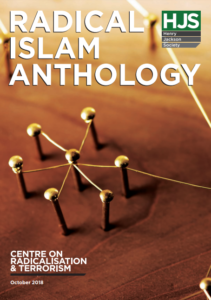 Today, the Henry Jackson Society has published this work in the form of the ‘Radical Islam Anthology’ – a collection of essays by nationally recognised experts on how to tackle the threat of Islamism. Combating Islamist groups: Organisations such as the Muslim Brotherhood-linked Council on American Islamic Relations (CAIR) and the Islamic Society of North America (ISNA) (in the United States), as well as Muslim Engagement and Development (MEND) and the Coalition Against Global Extremism (CAGE) (in the United Kingdom) are incredibly effective at gaining credibility by working with often unwitting respectable organisations. The movement against Islamism is small, and it requires allies. As such, there is a pressing need to create a network concerned with combating Islamists. This network must counter,by intellectual means, the network of Islamists who operate in a stronger and more sustainable capacity. Use of technology: The threat of terrorism is a global one. Individuals are becoming increasingly radicalised on their laptops and phones, and communicating the logistics of terrorist attacks on encrypted messaging services. In the United Kingdom, while it remains an offence to keep, publish, or distribute extremist content (both online and offline), a new ‘three strikes’ law applies a penalty of up to 15 years in jail for those who view terrorist-related material online three or more times. Any change in legislation will be met with challenges – and rightly so – but legislation must keep up with the times. For years, the Centre on Radicalisation and Terrorism (CRT) at the Henry Jackson Society has argued that vulnerable individuals should not have easy access to extremist and instructional terrorist material. Regulating the online space is crucial to obstructing the flow of logistical information and the consumption of propaganda, both of which are critical in forming the backbone of threats to national security. After all, it is in all of our interests to prevent a repeat of 2017, which saw five terror attacks occur in the United Kingdom alone. Countering the Islamist message: At the core of confronting and defeating Islamism is understanding why individuals are attracted to, and convinced by, the claims of Islamist extremists in the first place. In Western societies extremists have become increasingly adept at staying within the confines of the law, posing as non-violent moderates to win legitimacy, while continuing to promote the narratives and literalism of jihadists. These efforts must be tackled with more sophisticated and nuanced counter-messaging. Groups like Sharia4Belgium and Hizb ut-Tahrir are especially effective at creating a strong sense of membership, which is at the heart of a jihadist propaganda narrative.The agenda of extremists has been furthered by the growth of a cottage industry of books and public lectures from Islamists, which warn Muslims that they are losing their children to Westernisation. These messages must be recognised, analysed, and countered appropriately by governments working with community groups, schools, and the police. Crime and terror: It is clear that a crime-terror nexus has operated in the backdrop of terrorist activity, from the days of al-Qaeda and the Taliban, to the more recent Islamic State. Criminals and terrorists have areas of mutual interest: the illegal acquisition of weapons, documents, and money. This means some of the same instruments, such as organised crime units, can be used to capture terrorists or would-be terrorists. Therefore, there is a clear opportunity to disrupt the activities of those who disseminate Islamist extremism within the law by focusing on their peripheral criminal activities, such as tax evasion, fraud, and records of domestic violence. This anthology pushes for an increased focus on measures to reduce the appeal of Islamism, and violent and non-violent extremism, as well as to protect those who may be vulnerable to its message.